Coming into tonight’s League opener the bottom line for us was to get a win. Champagne football could wait, slick, well-worked movements could be kept in store for another day. A win, any old win, would do and that was what we eventually got tonight at MacHale Park. It’s impossible to overstate just how difficult the conditions were at Castlebar tonight. It was cold, it was wet – sheeting bands of rain being driven across the pitch – and it was incredibly windy. The near-gale conditions were there from start to finish, the wind howling directly down the field into the Albany end where the one of the cable stays holding the netting behind the posts snapped just before throw-in. We got the night’s opening score. Evan Regan won a soft enough free within range and he cleverly swung it into the teeth of the wind and over the bar. That score – bagged with less than five minutes played – was our only one of the opening half. Within a minute, Compton – from play – had levelled the game and with Robbie Hennelly already having trouble with his restarts (not his fault, it was impossible to come up with a good restart strategy into the wind as Roscommon found out after the break) the visitors soon began to put us under pressure. An Enda Smith free put them ahead and when the kickout was turned over out the field a speculative effort from them put the Rossies two clear. They had a goal chance soon after. Cregg was played in and tried to lob Robbie but the keeper did well to paw it over the bar. Another pot shot soon after – this one from over 60 yards out – put them four clear. While they had the benefit of the wind, we had to use necklaces of handpasses to make progress up the field. Roscommon frequently had fourteen men in their own half so it was no surprise that our attacking efforts repeatedly came to nought, as they eventually turned us over and broke forward. So we went into damage limitation mode, opting to hold the ball out the field in order to put a lid on the amount of scores they’d get to rack up before the break. This worked. We didn’t score again before the break but neither did they and that four-point half-time deficit didn’t look overly challenging. Roscommon were lucky to have their full complement still on the field at that stage. TV replays showed that Donie Smith was involved in a nasty eye gouging incident on Keith Higgins and the Boyle clubman was a very lucky boy to escape sanction for it. That incident, and the schemozzle that followed, brought an ugly edge to the contest. We withdrew Fergal Boland – who’d done well to link the play around the middle in the first half – on the resumption, with Andy Moran coming on. Conor Diskin – who was in the thick of the action all night – stayed inside with Andy, while Brian Reape came foraging further out the field. We got off the mark straight away, with Diarmuid O’Connor firing over a cracking point. Ten minutes and a succession of wides later, though, we were still three adrift and the huge home following – which I felt could have done a lot more to get behind their team tonight – was starting to get a tad restless. Then Keith Higgins was dragged down fifty yards from their posts and Jason Doherty rammed the free over. Two minutes later he did so again, this time from a free taken at least 60 yards out. Now we were – at last – starting to motor. They lifted the siege via a Compton point but Donal Vaughan – a strong performer all evening for us – responded promptly from play at the other end. Colm Boyle headed for the sin bin for a rash enough tackle. That could have handed Roscommon an advantage but by the time Boyler came back on ten minutes later we had surged decisively clear. Paddy Durcan, after great work by Brian Reape, knocked over the equaliser. Then Andy gathered a long ball played into the corner, fed it back to Paddy who laid it across to the unmarked Brendan Harrison. The full-back wasted no time before blasting it over to put us back into the lead. Seconds later Jason Doherty – lining out for the county for the 100th time tonight and in flying form – doubled our lead. A few minutes later Brian Reape found space inside and let fly with a thunderbolt of a shot that crashed to the net. The jig was now well and truly up for the Rossies. They’d been wasting time at every opportunity while they were ahead but now time was running out and they were five in arrears. We failed to score again before the finish but, as it turned out, what we’d racked up by then proved to be enough. Just about. They pulled a point back just after the goal but their next score didn’t come until deep in stoppage time. That score was a goal – from our perspective a hugely maddening one to give away so late on, a trait we seemingly can’t eradicate – but that was the last scoring chance the visitors got, with the final whistle sounding seconds later. A win is a win. It wasn’t pretty, the margin of victory could and should have been bigger but we got the result on what was a truly awful night for football. We did it largely thanks to the huge workrate the lads put in and the fact that they didn’t panic as they set about reeling Roscommon in over the course of the second half. So, in terms of the result, we’ve got the start to this League campaign that we wanted. We’ve won at home, we are – if only for tonight – top of the table. That’ll do for now. Mayo: Robbie Hennelly; Eoin O’Donoghue, Brendan Harrison (0-1), Keith Higgins; Lee Keegan, Colm Boyle, Paddy Durcan (0-1); Diarmuid O’Connor (0-1), Donal Vaughan (0-1); Fergal Boland, Aidan O’Shea, Jason Doherty (0-3, two frees); Evan Regan (0-1, free), Brian Reape (1-0), Conor Diskin. Subs: Andy Moran for Boland, Stephen Coen for Vaughan, Fionn McDonagh for Diskin, James McCormack for Boyle. Reape looks an addition, and we won coz we controlled the middle 8. One infuriating aspect was the continual lateral play even in the second half. What’s wrong with direct ball to FF line? Any win is a good win in those conditions. I believe we’re now something like a dozen games unbeaten against the Rossies in league and championship dating back close to 20 years and unbeaten against them in Castlebar for more than 30. Good to keep those two records intact tonight. We need to learn how to protect a lead in the closing minutes, that’s all I’ll say. Willie Joe, just one point you might need to clarify in your excellent report above. You said that Enda Smith was involved in the Keith Higgins incident. I believe it was Donie Smith, not Enda ? Happy with that win even with yet another late goal concession. I wouldn’t be too upset about it though given the night. Thought the lads did well to knuckle down and pull the play back when the Rossies parked the bus; their embarking on a such a defensive strategy with a wind like that on their backs kinda beggared belief – not the smartest. Really liking the cut of Conor Diskin, for a young lad he is well able to mix it up with the big boys. Harrison in no. 3 is a delight. I had doubts about Donie going into the game but he proved me wrong big time. Jason Doc was on fire there for a while. Reape took at least 140 steps for that goal, but really, who gives a monkey’s? Glad Robbie stayed between the posts tonight, he did well enough all things considered. Other than that it was a game that will only be memorable for the weather. Bloody brilliant to have those two points in the bag. A win is a win and on to the next one. 2 points in the bag that’s the main thing. However, the only negative and had been for quite some time is sloppy, loose goals. It’s three games in a row we have conceded goals that have crippled us except tonight we won by a solitary score. Regarding the supporters getting behind the team tonight WJ, I think you’re been a bit harsh, the bloody numbness in the stand probably had an effect! Donie Smith done the eye gouging, but ref booked Enda, their similar enough looking in fairness. Delighted Reape got his goal. He has to be persevered with. He will be huge for us in the future. I thought the rosses were absolutely terrible tonight. Playing 15 men behind the ball with a gale behind you. And the hard man tactics which is a blight on our game. At least they played a bit of football under mcstay, Cunningham will be the ruination of them this year. At one stage in the second half as we were passing the ball laterally Horan was screaming at lads to get forward. Two debutants did well. What a goal by the grim reaper. Both diskin and reape well able to win their own ball and i hope they get a good run of games. Delighted with the 2 points. The general view all week was the importance of getting the 2 points – well that we did and regardless of how it was achieved right now it doesn’t matter. What Management will learn from this match is hard to tell but the result will mean there will be a spring in the step of everyone at the next training session and that’s the big positive coming from this much-needed win. Roscommon shot themselves by not pushing higher up in the first and having a right go. They scored something like 1-2 in the second half which was a decent score considering the conditions. If they had been a bit braver early on they could have won the game. Having said that Mayo deserved it. Their handling in general was excellent considering the slippy ball. The new lads done really well especially their ball winning. Team looks physically strong all over the pitch. Jason got couple of super long range frees when we needed them. Great start! Wow… Eye gouging… Even for the Rossies that’s a new low. Impossible to read anything out of the game. Weather was unbelievably bad… 2 points, move on. Nice to see a home win.. Its been a long time coming. Some display by Doc but there was no shortage of notable performances in very trying conditions. A win is a win at the end of the day.Thought it was Kilroy with the finger in the eye but heard since that it was Smith. He was a very naughty boy and left it there too long and he’ll be lucky to avoid punishment. Hats off to the Rossie lady behind me in Section 102 Row HH who shouted encouragement for her team the whole way through. Two points from this particular game is the only positive. Fellas still touting Robbie over D.Clarke, shaking my head. A disastrous fumble in the first half presented a Rossie forward with an open goal that he inexplicably contrived to miss. Kickouts being lamped on top of the Sheep Stealers’ centrefield pairing who said ta very much, I will collect those marks. @spotlight the lateral play was due any time either of the teams kicked the ball inside the wind took it another 20 yards so in fact Mayo lateral play was very good and patient.it wasn’t a night for direct ball. Very good defensive performance from mayo in ist half however Roscommon were very negative with a Gale behind them and had 12 men behind the ball . Good overall performances o Donoghue Harrison Vaughan Doherty Reape Diskin . 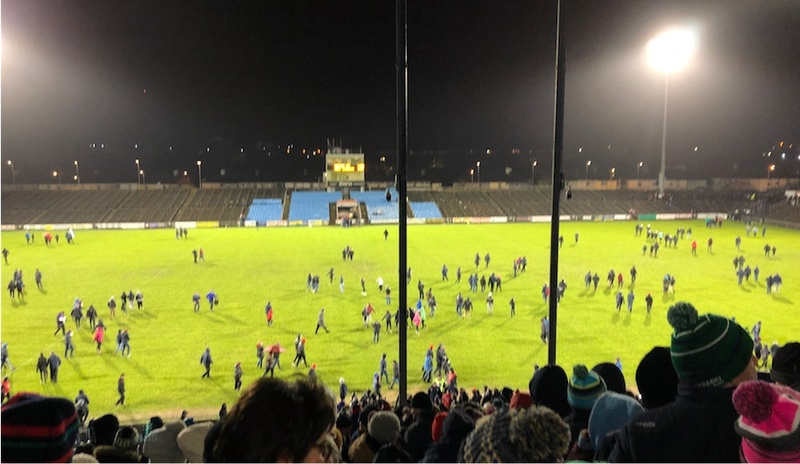 Willie Joe – great report as always – debutants did well – storm was from the Albany end not into the Albany end – I am being pernicity but it was a historic night – the worst conditions played in by a Mayo team?? From where I was looking, Mayoforever, the storm was blowing from the bacon factory end straight into the Albany end. Blowing strong too! Thanks all for the correction re the gouging incident. I’ve now updated the match report accordingly. @mayoforever eh…… The Albany end is the end with the big Albany sign painted on it. @mayoforever the Albany end is the opposite end to the bacon factory end where the old Albany writing is on the terrace.not where the shop is located! I was on the Albany end. It was hard to stand such was the ferocity of the wind. The pole to the right of the goalposts holding up the netting came loose and will need fixing. One of the advertising boards behind us broke and blew away toward ballyheane!! I agree with WJ. Crowd were very slow to get going. More effort required from people in the stand! Great to win but we 1point doesn’t reflect our dominance. When the rossies began to run at us in 2nd half we looked a bit vulnerable at the back. Having been to all 3 of our games so far this year my opinioj is thad defensively we’ve not been solid or tight enough as a unit. We’ve had some decent individual performances but this is somewhere we need to improve on. Fairly quickly. It’s grand lookimg good in possession but we need a strong tough and tight defensive unit if we have any aspirations of featuring prominently later in the year. Sloppy goals and being cut open easily will win is nothing. Great to get the win. Disappointed with the ref. Players need protection no matter how big they are. Thought the side line could have been more proactive. 1st sub at half time, 2nd in the 69th min. On a night like that fresh legs were needed earlier and more often. Great performance from Diskin, he showed me something. Not afraid to mix it and get stuck in, on his league debut, 20 years old. Well done. Different generations but it used to be the bacon factory end and Davitt house end in the old days! A win is a win despite the terrible conditions but the state of the pitch was appalling. Doesn’t seemed to have recovered from a year ago. Players slipping and sliding all over the place. Big concerns about our defence and midfield coming up against Tyrone next week. Very mature performance from Diskin, lot more to come from him. Reape did well do and Harrison was impressive. On the negative side giving away goal at the death, we sure don’t win easy. And some players living on the edge, we’ve got to watch our discipline. Wonder about AMoran substitution at half time and would love to have seen more of Fionn McDonagh. We won a lot of good possession, AOS, a key figure and we’ve got two points in the bag. Some night for a game of football .Fair play to the lads. Nice feeling winning a battle like that will give them confidence going forward .We looked fairly fit .Roscommon were the masters of their own downfall and could and should have won the game .They didn’t commit enough to attack .Doc stood up to night as he has done on a lot of occasions but I don’t think he gets the credit he deserves .Durcan proved again he can deliver big scores when needed .Reape impressed me that goal was pure class. Onwards we march. Mayomaningalway you’re right on a lot there but I don’t think ros should have won the game. We dominated possession throughout and looked the better team. Thought we could have more direct in our play. Aido did fairky well but thrre were lots of timed he should just go straight for goal, he’ll be pulled down or create havoc. He’s deadly when he goes straight for it rather than lateral jinky play…same goes for keegan. They are more likely to adopt this approach in the summer I suppose. Mayo were the superior team tonight and should have won by at least 4 points. I would have taken a 1 point win before the game. It was a must win to avoid relegation and it ends our horrendous run at MacHale Park. Not a night for good football obviously and especially tough for forwards. Very harsh taking Boland off at half time. What was he expected to do in the first half against that gale? Delighted for Reape getting the goal and Diskin showed well. Harrison, Durcan, Vaughan and Doherty were the best of the established players. Boyle did some good things but he’s becoming a liability with the number of cards he picks up. I’d like Plunkett to get a chance next weekend at number 6. Well done Mayo . The weather made it a real lottery . If it was a good night we would have won easy. Roscommon will really struggle in Div. 1. Mao defensive strategy is exposing Fullback line. Harrison will make a decent FB but was left exposed by the system as Caff and Others have been before. Midfield also poor so far this year. Diskin did well and should make grade Reape showing promise However Regan and Boland not physically strong enough for championship. I’m looking forward to seeing Ryan O Donnoghue if he gets a chance. Also think loftus kck passing has something to offer. 2 points on board 4 more for safety in 6 games should be attainable! @Mayonaze superior team in the terms of possession but would Mayo be able to produce a winning score tonight if the goal didn’t come? god forbid if the score was 0-8 to 0-7 and that late rossie goal ended up winning the game. There’s a fine line between eating up the clock in the first half & getting turned over for the want of having a shot!. Also;Would I be right in thinking that was Harrison’s first ever score? Christ … That was one shocking night for football . Thought Donie , Harrison , Paddy and Jason did very well in horrendous conditions .. As for EYE gouging .. If proven I hope he gets 6months off the pitch .A dirty , cowardly act which has no place in the Gaa ..
My Ball, I agree with you in relation to the eye gouging. Unfortunately it is something that the authorities do not seem to want to take action on, given very persuasive video evidence of previous transgressions by Philly McMahon of Dublin and Ciaran Thompson of Donegal. I wouldn’t be surprised to see Dmith get off even though his act was blatant as far as I’m concerned. On the match itself, it’s hard to be overly critical of anyone on the night given the conditions and credit must go to the point takers on the night who took on responsibility for shooting from long range. Great to get a ie in Castlebar, it has been a long time coming. We all see football as a Summer game, but we forget that these guys play and train in January in cold miserable nights, this is the hard slog in football. It’s like the Soccer premiership or the Rugby Heineken Cup, matches being play on dreadful weather but those guys are full time professionals. Hard to sit in a cold open stand or terrace for a few hours at this time of year is, fair play to all the supporters also that turned up last night. 2 points in the mala and I didn’t hear of any injuries. It was crucial to win that game so a great start to the competitive year. Shame about weather but them is the breaks this time of year. What an awful night for a game. In fairness to both sets of players, thought they did well in such horrific conditions. No point in analysing the game – just delighted to have bagged the two points. 13 of the 26 named in the 20-24 year age bracket is what caught my eye. Also a few notable absentees not on the injured list. The dawning of a new era for our Mayo team. Vaughan rolled his sleeves up last night. Nice to see. Doherty very classy. Congrats on 100 games in county colors. I thought Boland had a good first half ans was entitled to a run in the second half he carried a lot of ball and with the wind is good for a long range point or two.Great to get the win horrible conditions for both teams Ross left our lads waiting 5 mins in the cold after half-time it didn’t work in their favour tougher battle next week onwards we go. Always nice to keep the noisy neighbours quiet. They hit a new low last night with the eye gouging thuggery. A long suspension called for there. Well done to the lads and especially the century man Doc. A step in the right direction to improving our home record too. Cavan game provides another opportunity. Reape should have been pulled for taking to many steps before the goal, Smith has a case to answer for interference with the eye area as does Higgins for his reaction with his head. Shocking conditions for football. Keith has no case to answer whatsoever. It was pure play-acting by Smith, collapsing to the ground holding his face, trying to shift the focus from the eye examination he’d just done on our man. Robbie Hennelly’s last kick out almost went wide at the other end! I am surprised, given the strength of the wind and his sheer kicking power, he didn’t try that earlier. A 50/50 ball on the edge of the opposing square on a night like that and god only knows what might have happened. Well done to Brian Reape and Conor Diskin. I think Fergal Boland was unlucky to be subbed. He was doing as well as the other forwards and I reckon playing with the wind would have suited him. I hope it’s not the last we see of him. I thought Boyle was very good. He was brave and committed on a night when steel was required. His card was deserved and a bit silly but I would have him in our defence every time if he is fit. 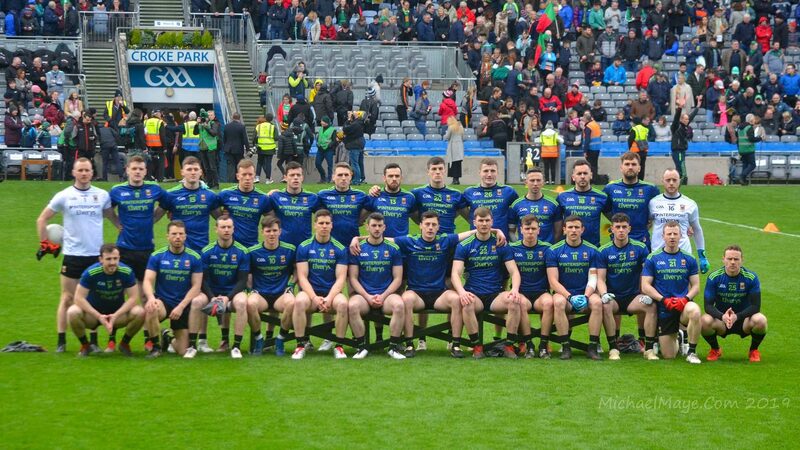 Joke of a performance, needed an illegal goal to help win(how many steps taken) by a near full strength team against a Roscommon team that had 4 starters from the connacht final, going nowhere fast, the team is finished. Wonder which county our latest troll Sharkie hails from? Worst conditions ive seen a match played in.Only realised how bad it really was when leaving and saw the advertising hoarding ripped down at the albany end.Glad the crowd didnt get too frustrated with all the lateral handpassing in the 1st half, i think it was a tactic as WJ said to stop ros for scoring and breaking.I thought the crowd got behind the team in the 2nd half.I was disappointed with the late goal.Just like against Galway we knew they had to go for go and we let them in.When they ran at us they carved us open a few times and also put a few high balls in that were one on one.We cant return to the days when our full back gets isolated.Smith really embarrassed himself,first the eye gouge and then the dive,he was a coward not once but twice in the space of 5 seconds and i hope theres some consequences .I was not expecting Aido to be fit but he put in a great shift along with Paddy,Doc,Harry and Donie.Reape took his goal very well and Diskin showed well,very excited to see these boys on a half dry sod.Overall delighted with the win and on to Omagh with a positive outlook! Horrrendous night for football. Credit to both teams but the eye gouging is a very serious incident and needs to be treated as such by the GAA. Let’s hope they don’t turn a ‘blind eye’ as usual to this sort of thing. Mayo’s tactic of eating up the clock in the first half worked as only trailing by four at the break. Horrible to watch but effective. It kept Roscommon pinned back in their own half. If they were more attack minded and pushed out to squeeze Mayo with that wind behind them it would have made more sense. Impressed by Reape and Diskin. Look to have settled into their roles and will be very interesting to see them on a fine day! Thought AOS should have moved out to contest Ros kickouts in the second half. The high hanging ball was made for him. Did well otherwise. We continue to leave huge amounts of space at the back and one on one in the fullback line. Another poor goal given away in added time. We need our full back line to defend first and not take every opportunity to get up the field. Harrison popped up to take a nice score but the goal cancels that out and more. Hennelly gives me heart palpitations. Home win and two points. Really tough game next week and the Rossies will look like altar boys compared to an Lamh Dearg. We have serious history there and very recent history as regards Leroy so I am expecting a real battle. The result may not be as important as how we handle the challenge. Best thing that could have happened in relation to the eye gouging was that he wasn’t given a paltry yellow card. At least now the CCCCCCC can issue a ban! Just saw the gouging video. The attempted gouge, followed by a dive. He’s some disgrace to himself. Higgins did absolutely nothing wrong. He was clearly angry (as would anyone if someone tried to gouge their eye), but deserves enormous credit for not flooring Smith. I’m not sure I would have been so restrained, so fair play to Keith for keeping his head. Between the gouging and his dive to the ground, Smith should be ashamed of himself today. Also nothing will happen Smith I would say, Donaghy, McMahon and O’Gara set the precedent for that. – You would really have to be there to fully appreciate how bad the conditions were. – I know someone heavily involved in a big club in Roscommon and he told me the Rossies have done a lot of speed and fitness work already and it showed. – Aido is some man to keep his cool despite numerous players goading him …I don’t know how he does it. I fear for the Tyrone match if this remains the strategy against a far more efficient packed defense. Reape and Diskin look as if they are well able for the battle. Lets hope they are given the chance next week. Folks we won the match, relax . I have yet to recall a league match where there was a perfect performance. We’ve played our first competitive game of the year & won , were people expecting champagne football or something?? Great start for Mayo, in those conditions everything goes out the window, so the win is most important. Maybe Boland picked up a knock as i thought he was battling well , his confidence may be hit a little by been taken off two weeks in a row. Fair play to you hardy souls who were there. Fantastic credit to both teams for battling that horrendous night of the most awful conditions. Personally I don’t think it’s rite to be playing in conditions like that. For Aiden’s 1st game back I thought he was great, and what he has to put up with!! Couldn’t see what happened with Kieth Higgins until tv last night, but no wonder there was trouble after it. Olive Tks for the laugh ‘re Sahara designer on stand. It was difficult to stand up and walk to car after it. The reality is the Goalkeeping number 2 position should have been put open for competition this year. Clarke is one of the top 5 keepers in the country over last 3 years so it should be him plus someone else. Schlingermannn was an outstanding shotstopper at minor level also there surely some other candidates in their early to mid twenties in the county. Players have to be judged on what they have or can deliver otherwise the team is going to get nowhere. The average age of that team was 26. There was 2 debutants and 7 of the starting team was below the age of 25. What more to ppl want? Start some of the U12’s! That was a must win game and I think Horan’s selection was right. There’s nothing wrong with different viewpoints but it would be helpful if people didn’t post idiotic claims like “this team is finished” (average age of the starting fifteen last night was 26). It’d also be good if those responding didn’t reach first for the trolling accusation. On the team’s display last night, I’d just repeat what I’ve already said in the match report – which others who were there have echoed – about the conditions. It was all but impossible to play football in that weather and both teams deserve credit for doing what they could in the circumstances. It’s pointless casting judgment on the team’s display in light of the weather last night. i agree age wise the team looks okay. The big risk i see is big men around the middle, we were in a much stronger position in this area 3 to 4 years ago. it’s a problem that’s very difficult to fix potentially Durcan and Ruane could be given game time in there to widen out the options or Cian Hanley given a run as a 3rd midfielder. Fair enough Willie Joe, I think your comments on what I saw as a fairly blatant attempt to get a rise out of people are indeed accurate. I was just calling it as I saw it, given the conditions and time of year the game was played in. Some might feel that a game in horrendous conditions should be taken as an indicator of how the future of the team should be viewed. I can’t for the life of me see how hat conclusion could be drawn but each to their own. Fair enough Willie Joe. Can’t disagree with you, was just calling out what I saw as a blatant attempt (as Joe called it some fairly childish commentary) at a wind up given that it’s only January and the game was played in atrocious conditions. We got the 2 points and that’s what counts. The Dubs have really struggled since Goldrick went off at half time..
Dubs just got schooled .Their fitness levels do not look as high as this time last year .Monaghan wasted a lot of ball and still got the job done .Dubs looked very flaky under high ball. Those who are critical of Mayos performance last night and suggesting the team is finished either were not in McHale park and/or just haven’t a clue about playing football in conditions like last night. Mayo were impressive in the first half in dealing with the conditions, kept possession, kept the score board down and critically didn’t kick possession away to an opponent with a strong wind advantage. Mayo played as well as can be expected on a night like that. Also it wasn’t a night for being critical of individual errors as they were happening all over the place but that doesn’t stop people using it as an excuse to beat one particular player with. Jason D admitted in his post match interview that everything they had practised in training went out the window due to playing conditions.Thought we did well to eek out a win in brutal conditions..Coupled with Monaghan doing the business against Dublin, its a pretty good start to 2019! Well done on a great win last night in horrific conditions, I hope some Mayo people took my advice as posted yesterday and backed Monaghan at 5/2 today. As I said I never did and never will back against the Dubs but I honestly think Monaghan are a very good side. I thought your Captain was a real leader last night fair play to him, he was my man of the match for you lads. Mayomad – agree there, if Diskin and Reape can realize their potential I think we’ll have a good year. Looks like Reape may have a knack for scoring goals, lightning fast on the trigger. He’s a leader too, saw glimpses of that yesterday on his debut and only 20. We’re always strong in defense and will have the fb line sorted come championship. Feel good about the start of the born again JH eta. Reape is 22. Those 2 points were vital. Looking round at the results today, there’ll be no easy wins. Tyrone, Kerry and Dublin away and then 3 blankets in Castlebar. Monaghan utilized the offensive mark today and it’s something we should look at using too. Aido is one of the best fielders in the game and reape and diskin are both big men able to win 50/50 balls.